Are Savings Groups a Waste of Time? Living on Kibuba hill in the community of Kabarore, Burundi she had seen her hard days. Clean water was difficult to access. Crops were unreliable. Money was scarce. So when Food for the Hungry (FH) Burundi showed up in her community, she had her doubts about their proposed projects. Specifically, she was skeptical about Savings and Loans groups. Marie-Rose was asked to join the first Savings and Loans group in Kibuba in December 2017. With a profound lack of confidence, she agreed. In her own words, here's how it went down. "When the FH staff started teaching us about savings groups, I thought they were wasting their time and ours. "I was registered in the first savings group without any confidence or trust in FH. I suspected that I may be cheated and lose the small amount of money I was hardly making. "But after three months of membership, I followed the other members' move by borrowing 50,000 BIF ($35 CAD) and bought a pregnant goat. Now it has given me twin kids! With the 60,000 ($42 CAD) I have just received from my savings share in December, I am planning to buy another goat for 50,000 BIF. "I will use the remaining 10,000 BIF to celebrate Christmas day with my family! 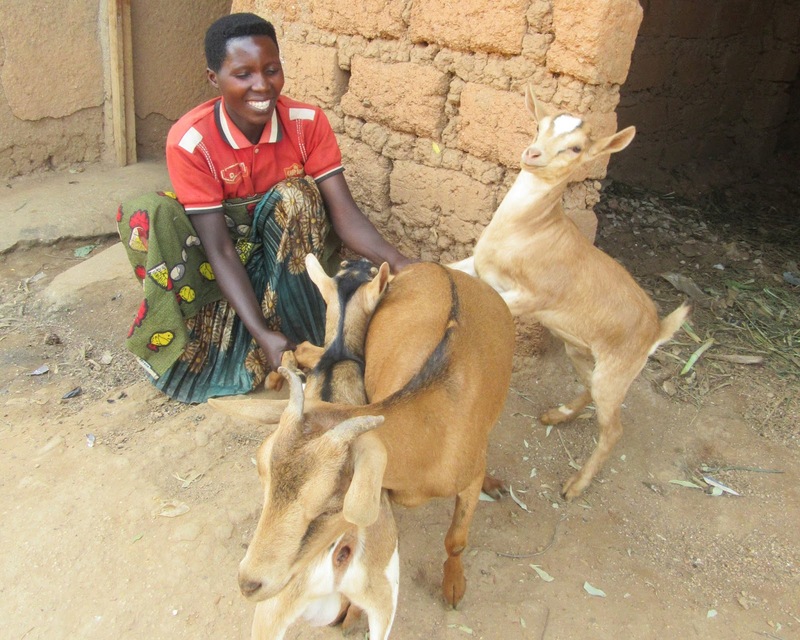 "I hope when I sell these goats, I will buy a cow and my family's living conditions will be better from now on. I now thank FH very much for having brought a savings culture into our community." How do Savings and Loans Groups Work? A group of people come together to pool their savings in order to create capital they can then take turns leveraging. Each group receives a "Piggy Bank"—a secure lockbox, ledger, and accounting books. FH trains the group in financial literacy, savings practices, and small business management. Every week or two, the group meets together so that each member can contribute to their savings. This pooled savings creates capital that members can borrow to make one time payments for items such as school uniforms or medicine, or to invest in land, small businesses, livestock, etc. Borrowers pay back their loans as they are able at low-interest rates, while still regularly contributing to their savings. At the end of a "cycle"—often one year—each member receives their savings paid out and can choose to use it or re-save it in the new cycle. Why is this system better than microcredit or microloans? For starters, all the funds come from within the community and stay within the community to enrich residents—there is no external "loan shark" knocking on the door, nor is interest being syphoned off into another country or community. In addition, the relational nature of the groups builds social capital and holds neighbours accountable to each other. Decisions are made collectively, strengthening the group's resolve to see each member thrive. Marie-Rose's savings group meets together regularly. Food for the Hungry: Are Savings Groups a Waste of Time?